In 2005 at the Library Theatre Company the first seed of Storybox was sown. Through a desire to explore how the spontaneity and playfulness of theatre can be used as a way to engage people with dementia, the Library Theatre worked with artists Kerry Tuhill and Andrea Vogler to develop the first residency. This was at Hall Lane Resource Centre in Wythenshawe and over a ten week period “Ye Olde Murder Mystery at Old Hall Lane” was created. This was participatory (and often anarchic!) murder mystery adventure that engaged older people, their carers, and families together, and that culminated in an improvised celebratory performance attended by over forty older people in the lounge at Hall Lane. Parts of that first project were observed by the CQC who commented upon it being an excellent and innovative example of engagement and participation in a day care setting. It was from this that the STORYBOX idea emerged – and a belief in the profound ability that performance and imagination have to engage, enliven and empower people with dementia. Through the support of Manchester City Council the first STORYBOX pilot was developed. In the creative hands of Lowri Evans and Sara Cocker this went onto become the three year project supported by the Paul Hamlyn Foundation that we are celebrating today. 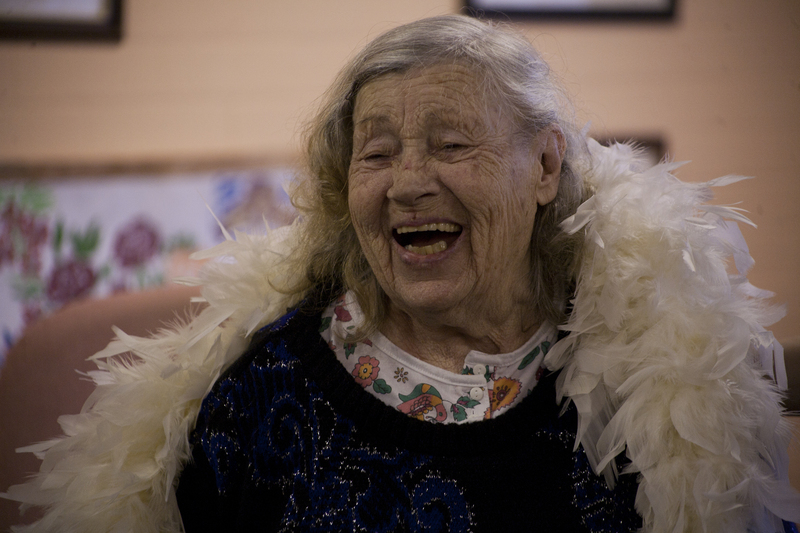 During this time hundreds of older people, and the people who support them, have taken part in the project. Through the visionary, sensitive work of Lowri and Sara, supported by artists such as Jen Harris, Clare Ford, Leonie Higgins, Nicki Hobday and Donna Redgrave to name but a few, STORYBOX has grown to become nationally recognised, and remains innovative, groundbreaking and inspiring for those who take part in it, or who experience it through other ways such as training, conferences, films, publications… the STORYBOX word has certainly got around! Storybox was originally developed by Liz Postlethwaite, Lowri Evans and Sara Cocker at the Library Theatre Company through the support of the Paul Hamlyn Foundation and Manchester City Council.